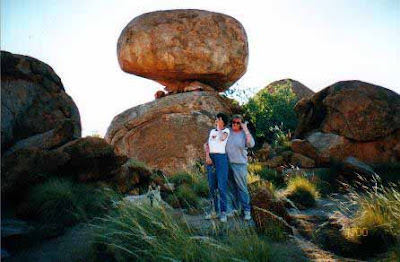 During the July 2000 school holidays Danielle and myself, along with Skye and Wolfgang (a tiny dog we were looking after for 6 months whilst his owners did a trip around Australia) hitched the trailer to the Little Red Drover and set off on the long trek from Victoria to central Australia. We drove across Victoria and into South Australia passing quickly through Adelaide then up to Port Augusta where we joined the Stuart Highway. This part of the trip was very exciting as the earth is red and the trees are only small and there’s lots of saltbush. "Road Train" Northern Territory, these massive trucks can take up to 60 minutes to reach road speed of 100 km. 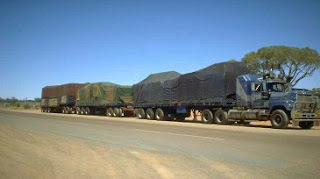 We were on long straight roads where you could see for miles and miles and there were a lot of road trains with three and four trailers attached. They all travel around 100 kph+ and as a courtesy to the drivers we got out of their way as quickly as we could. Apparently they can take up to one hour to reach road speed, so it must be very frustrating to have anyone slow them down. There were also a lot of dead kangaroos beside the road and very large eagles feeding there and they’d fly up into the air as we went past. After leaving "civilisation" our first overnight stop was at Glendambo Homestead. The only buildings at Glendambo were a petrol station, cafe and caravan park. While I was setting up camp Danni went over to say hi to our neighbours who were from England and were very friendly people. The parks are different to what we are used to, there’s no grass and all the vans are just in straight rows and everyone gets up early in the morning and leaves by about 8 am. Sometimes we got up early too, but we didn’t usually leave until 10 am as we didn’t want to rush too much in the mornings. While travelling up the Stuart Highway the fuel stops and homesteads are about 250 km apart which was lucky for us as with the trailer on the fuel consumption drops down to about 250km per tank. Usually the Drover covers 450km on a tank, but we also carry a jerry can, so we can get an extra 200km if necessary. Our second stop was at Coober Pedy where we stayed for 2 nights. We met up again with a young couple we’d met at Glendambo and camped next to them. They were having a one year trip around Australia and had left Melbourne at the same time as us. The camp site again was just red earth. Coober Pedy is a very dry and dusty place and a lot of the shops and hotels are built underground which makes them cooler in summer. We saw some underground houses and even a Church which is built underground, it was an Orthodox Church and because of the sense of quietness it felt like a great cathedral. 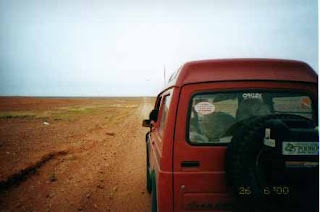 We also drove out on the Oodnadatta Track for a short way and had a look at the "Dog Fence". This fence runs from Surfers Paradise Queensland to the Bight near Western Australia, over 9600 kms. 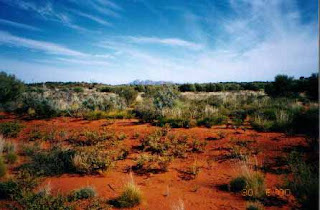 Dingoes are found to the north in Cattle country whilst protected sheep country is to the south. After leaving Coober Pedy we drove to Erldunda Desert Oaks Roadhouse, passing the NT border, and stayed there overnight, it was a bit noisy there though as there was a busload of school children who were running around all night. The next morning we left early and drove along the Lasseter Highway to Yulara Resort at Ayers Rock. We stayed here for 4 nights. On the first evening we drove out near Ayers Rock and watched the sunset. Danni wasn’t very interested in the rock that night as we had to wait there for over an hour, but the next day we walked up to Uluru (Ayers Rock) and then went for a walk around the base (not all the way as it’s 8km) and after that Danni kept looking at the Rock whenever it was visible in the distance. We also went to the Aboriginal Cultural Centre and saw singing and dancing and learnt about the animals in the desert. There was also an art gallery with some paintings with dots like Danni had done at school. 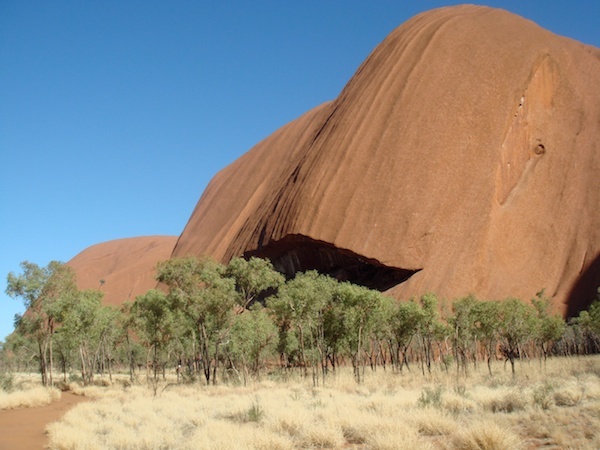 On the third day we drove out to KataTjuta (the Olgas). There are two walks you can do there, but both the tracks were very rough and so we could only walk a little way into them. But we really enjoyed the view from a distance. On the day we left Yulara Resort we had a bit of trouble with the tow bar (it fell off as we were leaving the resort, fortunately we were only doing 10 kph at the time!) and had to get it repaired so didn’t get away until lunchtime. We’d hoped to make it to Alice Springs, but decided to stop before then at "Jim’s Place", Stuart’s Well which was about 350km from Yulara. They had really good steak sandwiches there. Next morning we slept in a bit and then drove the short distance to Alice Springs. It was good to be in a "big city" again, and Danni enjoyed walking around the shops and went to MacDonalds—yeah!!!!! Danni loves their chips and cheeseburgers and coke. We spent 3 days in the area and went out to the West MacDonnell Ranges with its many gorges, chasms and waterholes. One favourite place was the Ellery Creek Big Hole where we had a swim. We were having such a good time on the trip that, after checking with family we decided to return home the scenic route—via Queensland—to drop Wolfgang off with Lisa—so we kept heading north. We very nearly drove past the Devil’s Marbles but decided to take a quick peek and it was a happy surprise to realise that we could camp there overnight (for free). So we were able to spend all night there and see both the sunset and sunrise which was really beautiful. There were lots of other families camped as well and we talked to lots of people and went for walks among the rocks. Next day we headed north to just past Tenant Creek and then turned east along the Barkly Highway, passing Barkly Homestead (the most expensive place for petrol on the trip), and into a new state Queensland. Just past the border we stopped at the small town of Camooweal where we were lucky enough to be there for the annual "Stockman’s Reunion". There were lots of retired stockmen and drovers there all walking around with very fancy riding boots and hats. 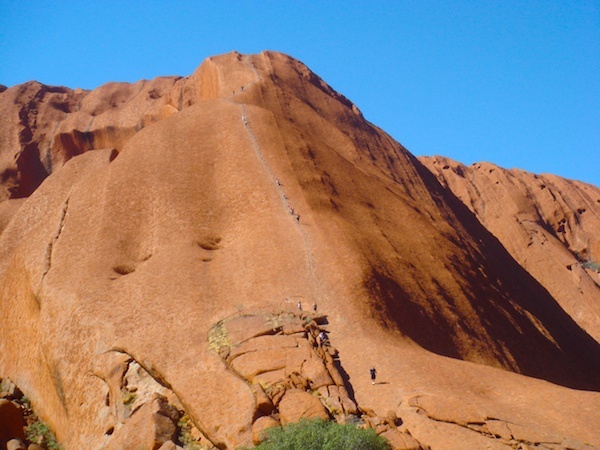 My camera was stolen in Noosa and so we lost all our photos from Alice Springs to halfway down the Queensland coast. When we left Camooweal we headed east through Mt Isa (lots of big trucks again), before heading south east on the Landsborough Highway to Kynuna where we had great fun at the Blue Heeler Pub and Caravan Park. We had really enormous steaks there and then stayed on for the evening. Danni managed to charm some of the young men at the bar to play lots of songs on the Juke Box for her—it was nearly all country music, but fortunately there were a couple of Shania Twain CDs as Danni is a diehard pop/rock fan. There were 2 blue heelers (as befits the name) and a puppy in the hotel and Skye and Wolfgang played with those dogs. While we were there a man came up to the back door of the pub for a drink and they took it over to him—he was sitting on a horse and the horse was halfway into the hotel, but no-one seemed to mind! We wrote our names on the walls like every one else had also done. Our next stop was Barcaldine, where we stayed in a motel and the lady who owned the hotel showed me how to clip Skye as she used to breed Cairn Terriers. Next day we drove and drove and drove and got to Noosa in the early evening. Lisa and Matthew and the children came out to see us the next day and said Hi to Wolfgang, they were very happy to see him and he them, but we kept him with us for the next 2 days as they were still moving into their new house. One day we drove out to the coloured sands beach and drove for miles along the sand. Danni liked it most when we went a little bit into the water and the spray came flying up to the windows. We took Wolfgang up to Buderim where Lisa lives and left him there. We missed his little presence in the back of the car, but didn’t miss him barking at everyone! We now had only one week to get back home to Seaford because Danni had to go back to school. We drove down past Brisbane and then through the Gold Coast looking at all the high rise hotels and then stopped at Ballina at a caravan park on an island, where we had to travel by car ferry to get there. Of course we had to stop at the Big Banana so Danni could eat her favourite fruit. Danni really enjoyed this part of Queensland as she could eat lots and lots of bananas. We stopped overnight in another motel, this time in Berrima, a really pretty village in the Southern Highlands of New South Wales. There were lots of old buildings, many craft shops and a bakery where we bought some very good bread. On the way south there was a wonderful roadside stop called Little Italy. 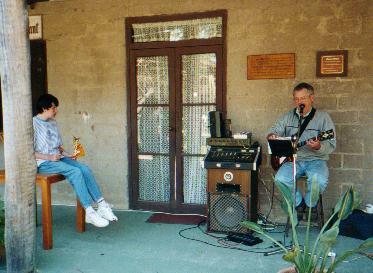 We stayed there for lunch and Danni enjoyed listening to a man playing his guitar and singing. He had been a teacher at an SDS school and he talked to us for a while. Our last stop was at Wangaratta, and then we drove home to Seaford. It was sad to stop as we all really loved travelling in the car and sleeping in the camper trailer. All up we made a round trip of 10,000 kms in about 6 weeks! It was a fantastic trip and we'd recommend it to anyone. A sort of "taste of Australia".